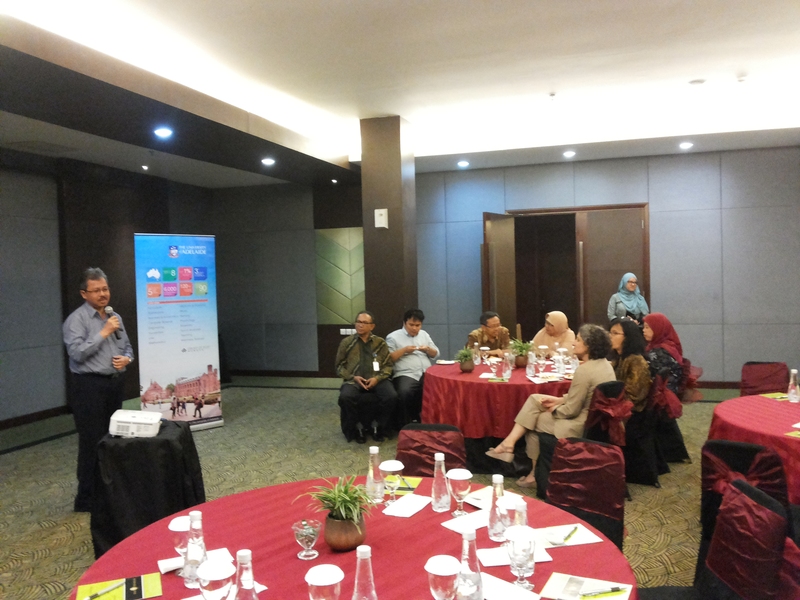 On December 4th, 2014, a networking dinner between the University of Adelaide and Bogor Agricultural University (IPB) was held at the IPB International Convention Centre, Bogor, Indonesia. This event aimed to strengthen the cooperation and collaboration between University of Adelaide and IPB. This dinner also provides opportunity for new Indonesian students at the University of Adelaide to network with fellow students studying in IPB and University of Adelaide. The event was attended by the IPB official staffs and faculty members, such as Prof. Anas Miftah Fauzi ( vice rector for research and cooperation), Prof. Dr. Ir. Yonny Koesmaryono, MS (Vice Rector For Academic And Student Affairs), Prof. Dr. Ir. Nastiti Siswi Indrasti, MSi (Head of Agroindustrial Technology Department), Dr. Nunung Nuryartono (Director of International Centre for Applied Finance and Economics (InterCAFE)); University of Adelaide official staff and faculty members, including Associate Professor Veronica Soebarto (Associate Professor at School of Architecture & Built Environment), Dr. Elisa Palazzo (Senior Lecturer at School of Architecture & Built Environment), Nicole Rizzo-Gray (Partnership and Student Support Officer); Students of double degree program IPB – University of Adelaide, and some alumni of University of Adelaide. Prof. Anas M. Fauzi in his welcome speech stated that IPB and UoA have agreed on a long-run collaboration framework by promoting double-degree programs, research collaboration and joint publications between researchers in University of Adelaide and IPB. IPB and Faculty of Profession University of Adelaide have set up & organized double degree program for Master of Applied Economics and Master of Applied Innovation & Entrepreneurship. Both programs have been implemented and still ongoing, involving students from the Ministry of Trade officers and Ministry of Industry officers. Prof. Anas also notified that IPB and UoA offer the Executive Programs with duration 2 weeks – 2 months for government officers to improve their competencies by taking short courses & comparative study in Adelaide. Chrisia Iskandar, In-country Representative of University of Adelaide for Indonesia, highlighted the importance of mutual cooperation between these two leading higher education Institutions. According to Chrisia, University of Adelaide wishes to enhance the collaboration with IPB beyond the Faculty of Professions. Currently, the two parties are preparingto set up the double degree program between the Faculty of Animal Science (IPB) and School Animal and Veterinary Sciences (UoA); and double degree program between Department of Landscape Architecture (IPB) and School of Architecture & Built Environment (UoA). The academic collaboration and cooperation between IPB and UoA is indeed a positive contribution to the relationship between the two countries, Indonesia and Australia. President elect Joko Widodo recently spoke to the media about his plan to merge Research and Development (R&D) agencies in differing ministries into a new Ministry of Research and Higher Education (Link: Vivanews 16 September 2014). His reason is clear- that is to improve efficiency, transparency and research impacts’ ‘measurability’. He explained that at the moment each of these current R&D agencies have their own budgets but unfortunately their research findings have not been integrated and made transparent to public. Jokowi therefore viewed that it is important to set up a new Ministry of Research and Higher Education which will not only improve the cost-effectiveness of research budgets but also make research more transparent and credible. He emphasised that research impacts must be ‘measurable’. This plan signals some challenges as well as opportunities. Whilst mergers will help Indonesia achieve economies of scale in R&D, the newly set-up Ministry is challenged to perform efficiently managing concentrated-budget and define and develop relationships with other stakeholders including universities and the existing Indonesian Institute of Science (LIPI) as well as wider research communities. Also important is to make the research projects being conducted transparent and credible. This is a very positive initiative and crucial but the devil is in the detail. What would be the criteria of transparency and quality of research? ; who would assess the criteria? ; do we have a strategic pathway which consists of short-term as well as long-term programs and objectives so that we achieve our goals; what is our goal? ; etc. To address those issues, mergers might be one of the starting points but longer-term planning and capacity building programs should remain two of the focus programs.